Hurricane season starts June 1. Make sure you and your family are prepared. Listen to the radio or TV or NOAA Weather Radio for information. 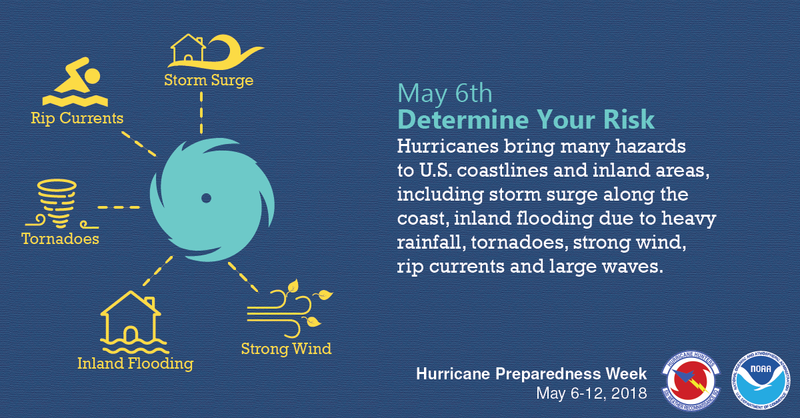 The 2018 Hurricane Preparedness Week runs May 6 - May 12. Today's tip from NOAA suggests families find out what types of wind and water hazards could happen where you live, and then start preparing now for how to handle them. Hurricanes are not just a coastal problem. Their impacts can be felt hundreds of miles inland, and significant impacts can occur without it being a major hurricane. I'm still locked and loaded from last year. I still need to get a few more things this year, just to make sure I have extra for those who did not do their due diligence and prepare. There's always a few. Heh. Today's tip from NOAA encourages people to develop an evacuation plan. The first thing you need to do is find out if you live in a storm surge hurricane evacuation zone or if you’re in a home that would be unsafe during a hurricane. If you are, figure out where you’d go and how you’d get there if told to evacuate. You do not need to travel hundreds of miles. Identify someone, perhaps a friend or relative who doesn’t live in a zone or unsafe home, and work it out with them to use their home as your evacuation destination. Be sure to account for your pets, as most local shelters do not permit them. Put the plan in writing for you and those you care about.